This environmentally friendly city put a green spin Tuesday on the checkout question "Paper or plastic?," becoming the first in the nation to outlaw non-recyclable plastic bags from use in supermarkets, drugstores and other large retailers. By a 10-1 vote, the Board of Supervisors required the use of compostable or recyclable bags — a move officials predicted could soon be imitated by other cities nationwide. One supervisor voted against the ban, saying the issue needed more study. Each year businesses here dispense an estimated 180 million plastic bags, killing marine life and clogging landfills, said Supervisor Ross Mirkarimi. The Plastic Bag Reduction Ordinance, written by Mirkarimi and co-sponsored by six other supervisors, gives major supermarket chains with more than $2 million in annual sales six months to make the switch to biodegradable bags. Pharmacies and retailers with at least five locations have one year. Violators face fines of up to $500. Come on other cities, join San Francisco. What took so long? I can't remember how many years ago I started insisting on only paper. 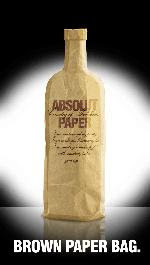 I found the paper bags to be environmentally superior and more useful. There's nothing like a nice paper bag for wrapping presents. Yeah, I'm that cheap. Update: As expected, Faux News came down on the wrong side of this. Brit Hume said this will confuse recyclers. They won't know if the plastic bags are recyclable or not. What a tool.